Colors: Black and Green. 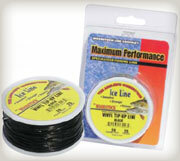 Woodstock vinyl coated tip-up line is the ultimate non-freeze ice line. This line will not absorb water, freeze or kink. It’s soft characteristics make it easy to work with in the harshest of conditions.